“The Future of Water” Conference was hosted by RBC Capital Markets and Amane Advisors. Those in attendance included senior management from a broad spectrum of globally leading water companies, including American Water Works Company, the largest publicly traded water and sewage utility company in the United States; Suez NA, an internationally distinguished water company; 3M Company, a world-renowned multinational manufacturing company; and Xylem, a globally leading innovative water solutions provider. This large-scale conference is aimed to bring together leading global water companies and service providers to shed their insight on a wide range of issues relating to future development of the water industry. Topics of discussion included fast movers in smart water, water utilities of tomorrow and investing in the global water sector. 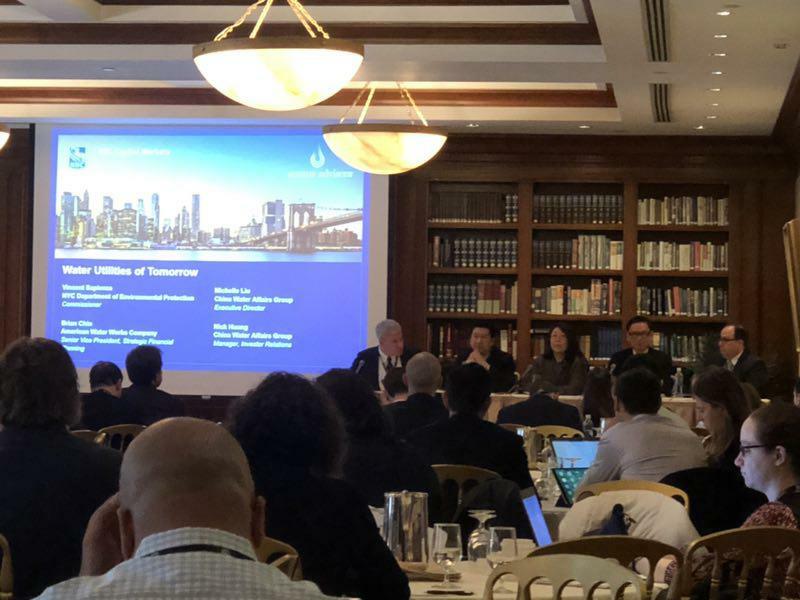 At the conference, Ms. Liu Yujie, Executive Director of China Water Affairs, discussed with the representative from American Water Works Company and the Commissioner of the Department of Environment Protection in New York City on different topics, such as smart water, the application of AI technology in the water industry, the use of reclaimed water and the industry regulation. Mr. Duan Chuan Liang, Chairman of China Water Affairs, said, "With the rapid development of the global economy, the water shortage problem has become increasing acute. There are pressing needs for this traditional industry to adopt new technologies for technological improvements and applications. We are delighted to be invited to attend ‘The Future of Water Conference’ and to make thorough discussions with the representatives of our global counterparts on a variety of issues relating to future development of the water industry, thereby driving the healthy development of the water industry and contributing greater efforts to the well-being of the society." China Water Affairs Group Limited is mainly engaged in the provision of city water supply, sewage treatment and drainage, and related value-added services in the PRC. Currently, the Company operates in nearly 60 cities, including three municipalities of Beijing, Tianjin and Chongqing, and those in 13 provinces such as Guangdong, Jiangxi, Henan, Jiangsu and Hubei. Boasting long-standing partnerships with various local governments, the Group has firmly established a leading market position in China’s water industry.